The Thrive Diet is a philosophy about nourishing the body for health and for high level athletic performance with a plant only based diet. A large amount of the discussion hinges on stress, nutritional and exercise stress in particular and how food can be used most efficiently to prevent and recover from various stressors. A family friend who was reading The Thrive Diet came to stay with me. This was the first I’d heard about the book and I was able to sit down and read the first couple of pages. Without having had the opportunity to read the first several pages I don’t think I would have chosen to read this book for two reasons. First, it is a 100% vegan approach and second, the author Brendan Brazier is the formulator of a nutritional supplement line (Vega). I like meat and I wasn’t interested in reading a 300 page sales pitch, however something in those first few pages peaked my interest: Brendan Brazier is an Ironman triathlete and a vegan. I eat and enjoy meat and up until very recently held firm in my belief that animal source protein was necessary for muscle building, strength and power. I believed without question that top level bodybuilding and athletic performance were only attainable with the consumption of meat protein. My belief system is likely the result of too much time in the gym being schooled by protein tub packing gym junkies. In the past couple of years I began to awaken to the idea that full nourishment and strength/power/endurance building capacity were possible with a plant only based diet. In the self published book Green for Life by Victoria Boutenko, Boutenko provides lengthy discussion of apes and their greens only diet. A large, strong, meat eating bodybuilder or athlete is still no match for the size, strength and power of the vegan ape. I have since been interested in exploring the vegan diet and athleticism further. Since I read alot more than most people about exercise and nutrition, I found alot of the nutrition discussion in Thrive Diet to be a review, but a much needed and enjoyable review with fresh approaches to some topics and a great eye opener about nutritional stresses. Brazier’s writing is clear and he provides excellent descriptions and analogies. Simple yet informative discussion of the impact of food production on the environment, food allergies and sensitivities, alkalinity/acidity, enzymes, soil quality, hydration, anti-aging, and the benefits of exercise make this a well rounded first foray into understanding nourishment and will surely set readers on a path of further learning. It is not at all a sales pitch for Vega, Brazier’s line of nutritional supplements, it is hardly ever mentioned. The author credibility: Brazier is a very successful athlete with an impressive number of 1st place finishes, with years of personal experience as an athlete and personal nutritional experimentation. 100 recipes for dressings, crackers, salads, dips, sauces etc.. that don’t contain breads, pastas or meat alternatives (ie; soy and wheat). You are starting to explore incorporating more plant based food into your diet. You are beginning a healthy eating journey and want to educate yourself about nourishing your body (even if you do not want to give up meat and dairy). You are an athlete or fitness enthusiast who is sick of buying so called health food to support your active lifestyle, only to find that it is full of sugar, wheat, soy, corn, preservatives and other unpronounceable ingredients. You are a health seeker looking for a broad sweep introduction or refresher on healthy and sustainable eating topics. You are looking to lose weight in a healthy way and have additional educational and support material such as info on caloric intake, glycemic index, portion size, energy requirements and a custom fitness plan. Meat or dairy bashing. If you are looking for a reason to remove meat and dairy from your diet, you won’t find it here. This is 100% pro plant. Counselling. As with any exercise routine or any other habit change, drastic lifestyle changes are rarely successful. There are a myriad of factors that influence successful lifestyle change (motivation, time, finances, food availability, family support, personality etc…) A daily meal plan really does not address the primary barriers to eating healthy. Caloric information for recipes. Brazier’s focus is on nutrient density and Thrive Diet meals may conflict with weightloss strategies based on calorie observance. Footnotes. While I believe in the value of personal experience, I am always looking for the ‘research’ or position stands. I am used to my nutritional literature accompanied by research studies and on several occasions while reading the Thrive Diet I found myself making notes on items I wanted to look up the research on. Sources of information and or footnotes throughout the book (instead of only at the end) would be great since I am one of those people that will actually go and read the study when quoted. While promoted as a diet for weightloss and health, the greatest value I derived form this book was the all natural athletic fuel resources. Although I do recognize the value of whole foods as part of a weighloss program, there is not much discussion of weightlosss and I really wouldn’t recommend this as a stand alone weight loss resource. 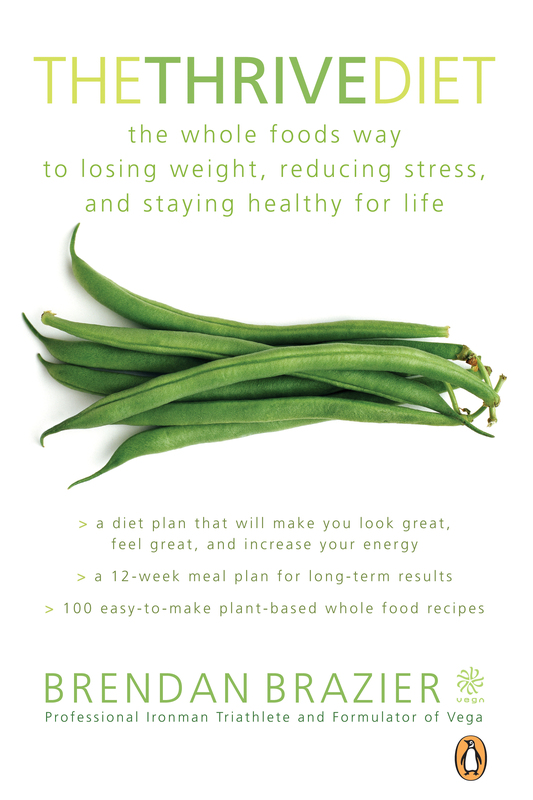 The American version of the book is more appropriately titled: Thrive: The Vegan Nutrition Guide to Optimal Performance in Sports and Life (Da Capo / Lifelong, 2009). I know that many people may be deterred by the vegan theme of this book. Even the words hemp, flax and sprouts will send some people running, but I really recommend this book to anyone looking to optimize the nourishment of their body, even if they are not looking to embrace a vegan lifestyle, enhance athletics performance, or even make drastic changes to their current diet. As someone who is attempting to eat fresh, local, organic, and preservative free I am always on the lookout for strategies to support my athletic lifestyle. While I am somewhat knowledgeable about pre and post workout nutrition this book serves as a powerful new resource for me that I will return to time and time again. One of the things I found to be unique and of tremendous value is the all-natural recipes for sport drinks, energy bars, energy gels, snacks and smoothies. As well as discussion of how to tweak servings to serve the nutritional needs of various types and lengths of physical activity. While Brazier’s incredible success as a triathlete is a testament to the vegan diet, I am eager to see more stories about vegan bodybuilders, powerlifters, football players, basketball players etc… Know any? A note about Vega. Vega nutritional supplements won 4 Gold medals in the prestigious Alive awards in 2009 and has an impressive list of ambassadors and a community for support. People wanting to implement the Thrive Diet in full or in part can actually overcome some of the barriers to lifestyle change with a considerable amount of ease by using Vega products. Save time shopping for hard to find ingredients and on food preparation with the ready made formulas. Are you a vegan power or strength athlete? Do you know one? Have you tried the Thrive Diet? What is your favourite resource for supporting your transition to a vegan lifestyle?